East Side Mario’s menu prices. East Side Mario’s is a Canadian restaurant chain serving homestyle Italian dishes. With a menu that includes pasta, pizzas, or entrees, guests get great value with East Side Mario’s all-you-can-eat soup or salad and garlic bread. With over 300 pasta-bilities, guests are sure to find a dish to enjoy. With every visit, East Side Mario’s aims to create a true Italian family dinner experience by offering a welcoming atmosphere and plenty of food. No guest will leave hungry but they will leave with a new friend. Below are the latest East Side Mario’s menu prices. East Side Mario’s family is HUGE and they want to make it bigger. Sign up to receive East Side Mario’s newsletter via email. By joining, guests will receive special promotion offers, exclusive membership deals, and be the first to learn about the latest news. Sign up is quick and easy plus East Side Mario’s will reward new members with a free appetizer. Why not let the little ones join the club? Mini Mario Club is great for kids as they will receive a VIP membership card for FREE meals and FREE Chillers. Parents must sign up for their kids. Kids 12 and under can join the Club. In 1987, four Canadian entrepreneurs opened the first East Side Mario’s in Miami, Florida. Today there are over 50 East Side Mario’s locations across Canada. East Side Mario’s is a subsidiary of Cara Operations and is headquartered in Mississauga, Ontario. 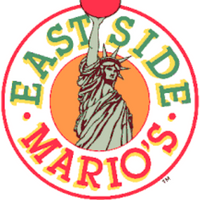 For more information about East Side Mario’s, visit their official website. Where is the nearest East Side Mario’s near me? East Side Mario’s locations can be found by clicking here. What are East Side Mario’s hours of operation? Does East Side Mario’s offer online ordering? Yes, East Side Mario’s does offer online ordering. You must have access to a computer or a smartphone (of course). After placing an order, guests can pick up their order or have it delivered.